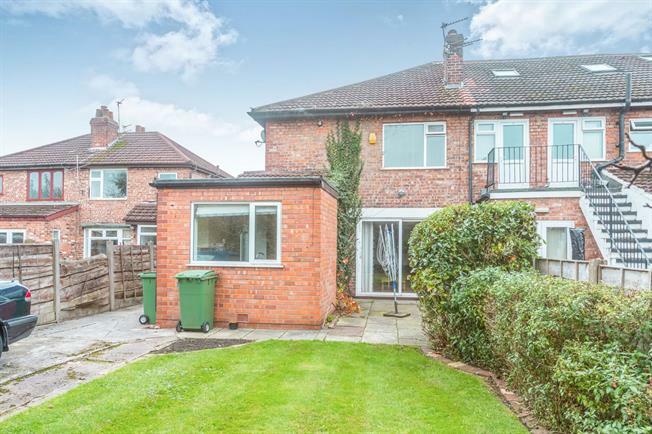 3 Bedroom Semi Detached House For Sale in Altrincham for Asking Price £345,000. A large than average three double bedroom, quirky semi detached property in a highly sought after location. The property has three very generous double bedrooms, two bathrooms and three reception rooms. In brief the property comprises entrance hall, living room, family room, living/ dining / kitchen room and shower room. Upstairs three double bedrooms and a family bathroom. Outside to the front is a generous paved area and driveway for several cars. To the rear is a garden mainly laid to lawn and mature planting. A generous entrance hall with a spindled balustrade leading to the first floor. A generous and light open plan space with the living area having sliding uPVC doors to the rear elevation. Feature fire surround with matching hearth and inset living flame gas fire. A generous space having a uPVC double glazed window to the side elevation, with ample space for a dining table and chairs. A recently remodelled room having a uPVC door to the side elevation and window to the rear garden. The room is fitted with modern base and eye level units with matching tops and tiled surrounds, inset into which is five ring stainless hob with decorative extractor over and double ovens below and sink with mixer tap over. Recess for an American style fridge freezer and integrated dish washer. A generous room having a uPVC double glazed window to the front elevation, and having ample space for a generous table, chairs and side boards. A fabulous room multi purpose room having a uPVC double glazed window to the front elevation. A further double room again having a uPVC double glazed window to the front elevation. A well proportioned and light bathroom having a shower cubicle, bath, pedestal wash hand basin and low level wc.